This weekend I am in Chicago and it’s the 4th of July!!! I came down from Minnesota where I am staying with my Grandma Patty and my Papa Fred. 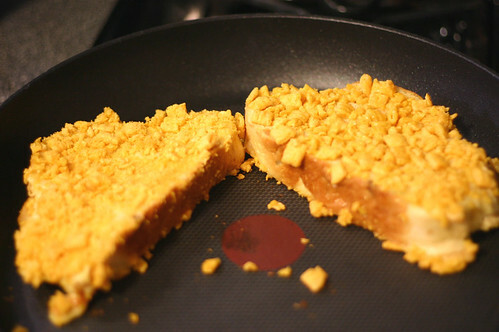 So today Mary and I made Cap’n Crunch french toast!! It was easy, fast, and yummy!!! I was so suprised how easy it was. Then you end up with such a great result. After that we went to the play Mary Poppins it was a good play!!! There were so many colors and costumes to see and I have never seen any type of Mary Poppins until today!!! Today was a fun day!!! Now we can hear the all the fireworks!!! 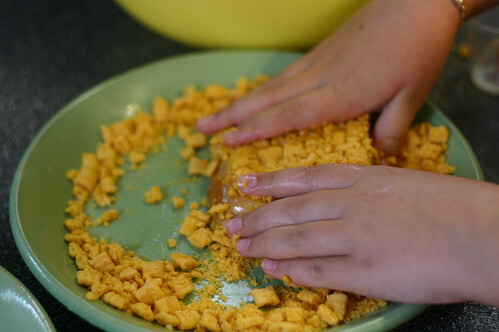 I started the Cap’n Crunch French Toast by putting about 4 Cups of cereal in a large ziploc bag and crushing them with a rolling pin. But I left some big chunks because Mary said to. Then I took a big bowl and cracked 4 eggs and put in 1/4 cup of milk and 1/2 tsp Cardamom (cinnamon works too) and I learned how to whisk eggs pretty good. 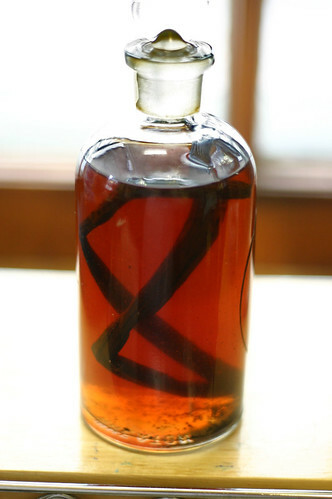 We used homemade vanilla, and there was so much sugar it really didn’t make any difference. Here’s the eggs and the cereal. 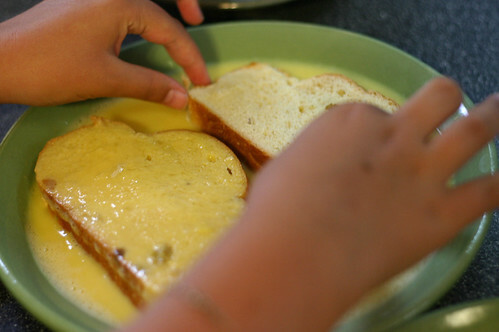 Mary cut a loaf of sturdy egg bread in thick slices. then in the cereal. I had to wash my hands because they kept getting sticky. Then Mary cooked them like regular French Toast. Except the first batch she burned because she said she had the heat on too high and the sugar from the ceral burned. When she turned the burner to almost on low it took longer, but looked and tasted better!!! 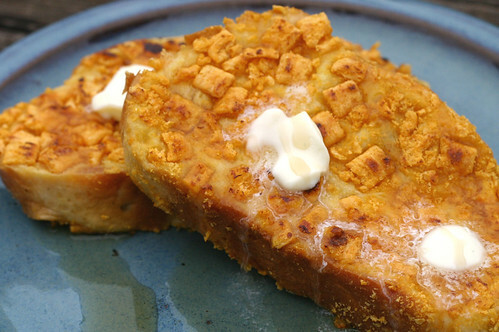 I love French toast and this looks amazing! Thanks for a great recipe! Thanks for sharing this Mary! I saw the pics on fb and thought yum! We leave for the beach tomorrow, might have to pick up some Captain Crunch – sounds like a perfect Wednesday morning breakfast! What an exciting way to make French Toast! Wow! 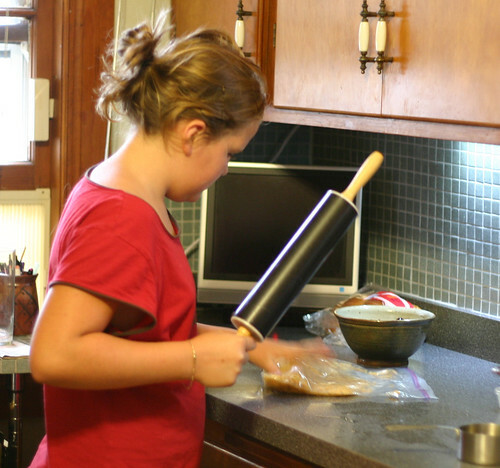 It looks like you can do some damage with that rolling pin. hehe Such a creative idea. I love this idea – I bet it was so yummy!! 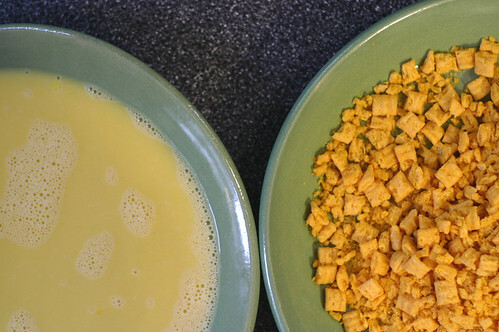 I’ve heard of making French Toast with crushed Corn Flakes but Cap n Crunch sounds so much better! I bet they’re sweet enough and you won’t even need syrup.